Since I liked the first two, I was interested in seeing this one. Agents J and K are still working together, and sometimes still clashing a bit over how to deal with certain things. When Boris the Animal escapes from prison, it sets off a series of event that cause J to travel back in time to 1969 to keep Boris from killing K then. I think this movie can stand alone fairly well, though a few things will probably make more sense if the movies are seen in order. The idea of J having to travel back in time is interesting and I think it works well overall. For the most part, this is a fun, entertaining movie, though there are a few moments that are more serious. There is decent action and a bit of humor, much like there was in the first movies. Because of the time travel, Tommy Lee Jones is missing for much of the movie. Josh Brolin does an amazing job as the younger K. It is like he is channeling Jones, and the result is a character that is a bit different, but still a believable younger version of Jones's K.
Overall, I enjoyed the movie and think it is worth seeing, especially for fans of the first two movies. Some of what happens is a bit predictable, but the movie is still entertaining. 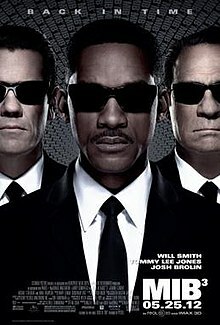 Yep .. this is one well worth seeing if you enjoy the whole MIB thing. I think Josh Brolin did an excellent job playing a young K (Tommy Lee Jones).